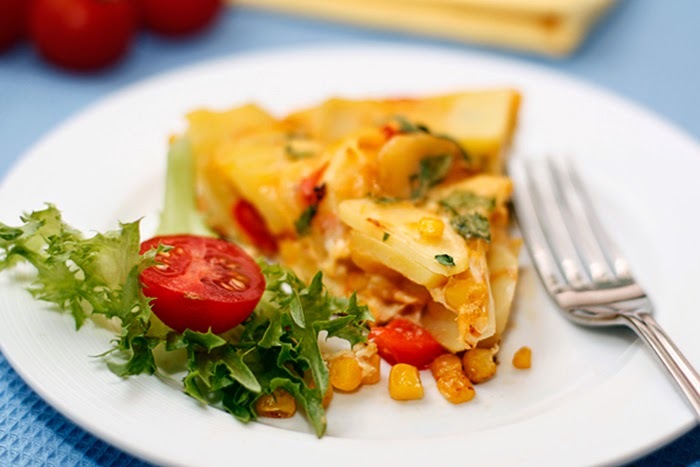 Spanish tortilla is a cross between an omelette and baked pudding. The main ingredients for this dish is sliced potatoes, eggs and vegetables. It is the best for breakfast. • Pepper – 1/2 pc. • Garlic cloves – 3 pcs. • Ground black pepper – 1/4 tsp. • Green bell pepper – 1/2 pc. • Sea salt – 1 tsp. • Eggs – 4 pcs. Peel and thinly cut potatoes; fry for about 10 minutes on the hot pan constantly stirring until it is soft, but not completely cooked. Remove seeds from multicolored pepper, cut into cubes. Add to the pan pepper, chopped garlic, salt and pepper. Add diced tomatoes and corn after another 5 minutes. Beat the eggs with a fork, chopped herbs and salt in a bowl. Pour the eggs into the pan when potatoes is tender. Do not stir. If your pan is with removable handle place it in a hot (200C) oven for a few minutes. If not, then just wait until the tortilla bottom fry over medium heat, and then flip and fry the other side. Serve hot or cold, cut into portions.